The Lower Depths, an early 20th century Russian play about people living in poverty in a homeless shelter, is pretty dark and depressing, but it's also a fascinating exploration of the universal themes of life, truth, and relationships. As director and adapter Josh Cragun notes in the playbill, "fundamentally, it is a show about humanity and what it really means to be human." The nimbus theatre production places the story in Depression-era America. 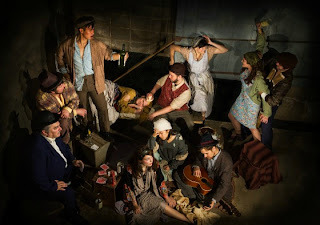 This large cast of diverse characters, embodied by a talented ensemble, lives in a run-down building, with only a bunk to call their own, and shares the joy and desperation of life with each other. Plotlines include a love triangle, illness, alcoholism, and depression, but more important are the ideas and the characters that are drawn. The ending offers no closure, but instead seems to say that this life and these people continue on. In a beautifully run-down and cluttered shack of a building (nicely designed by Zach Morgan), we meet a group of people down on their luck (as many people were in the Depression). Among them are an immigrant couple, an actor, a shoemaker, a formerly wealthy society lady, and a prostitute. Keeping them in line are the dysfunctional family of the landlord, his wife, and her sister. Into their midst comes a self-described pilgrim, affectionately called "old man" or "gramps" by the others. He listens to the residents, comforts them, and tells them what they need to hear to soothe or provoke them into action. Love, abuse, camaraderie, death, and celebration all have their place here in the lower depths. One of the residents happily exclaims that all you need is "food, drink, music, and friends," but there's a desperation hiding beneath the surface of the frivolity of drinking and the daily routines of shopping and sweeping. As the Wikipedia page nicely sums up, "The theme of harsh truth versus the comforting lie pervades the play from start to finish, as most of the characters choose to deceive themselves from the bleak reality of their condition." This is truly an ensemble piece, and nimbus has assembled a really nice ensemble of 14 actors. All of them have their moment to shine, particularly in the second act when plot gives way to a series of monologues about life, truth, and the human condition, and they all use it well. It seems a shame to call out any of them because they all do a fine job. But if I must: standouts include Andrew Sass in his intense portrayal of Karl (at the apex of the love triangle), Art Peden as the kind and gentle old man, a sympathetic Emily A. Grodzik as the abused sister, Nicholas Nelson as the tormented actor (of whose opera-trained voice we only hear a sample), and Brian Hesser as the genial drunk. The appropriately shabby and lived-in costumes (designed by Barb Portinga) help to create the characters, and the tone is set by Depression-era music playing before and after and the show and during scene changes, and all too briefly sung by the cast. In a time when issues of class disparity, morality and social welfare are taking the spotlight in our national conversation, this 110-year-old work has never felt like it had more to say. But the remarkable part about this play is that it does not preach. It simply shows. A world, a diverse set of characters, and their diverse set of views on truth and the human condition. Each one has insights, Each one has weaknesses. we are left to come to our own conclusions.